Moving In With Dementia: Dealing With "Dementia Loss"
Mom has progressed so quickly with her dementia in the past three months, and as the holidays are approaching I am thinking about how to handle the holidays with a loss. By loss I mean what I would call "dementia loss" which is not death of the body but loss of relationship with a person, loss of ability, and loss of communication. Last year she could make her famous Christmas cookies with me. Last year she could give advice on cooking the Thanksgiving turkey. Last year she could walk, talk, feed herself, and go to holiday events like our annual extended family trip to the West Side Market. This year is so different. We can't really chit chat about tips on making stuffing, or walk through the Market together and get the mincemeat for the pie. We will have to feed her her holiday dinner. 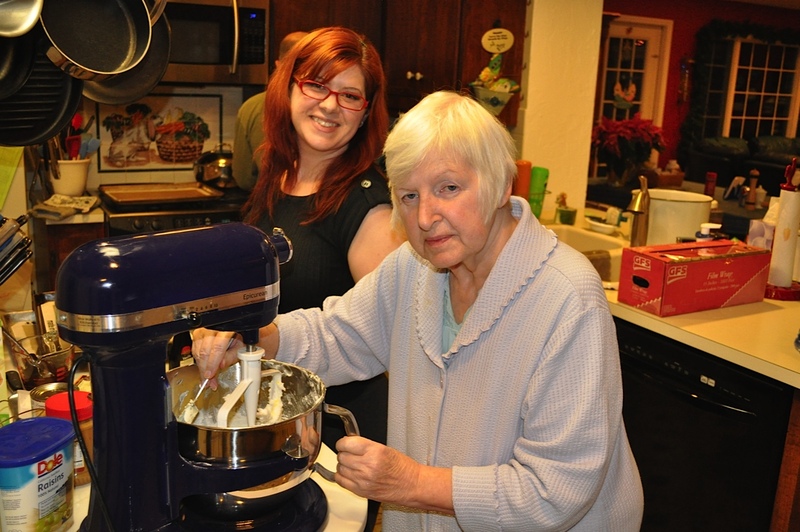 Making Christmas cookies with Mom last year. Christmas 2011. Mom is still here in many ways and often I see glimpses of her personality again when she laughs at things we say or when she surprisingly comes out with great one line zingers when she looked like she was staring off into space. However, she is not here as well. While I feel blessed when she connects with us through smiles and simple words, we can no longer have conversations together. I can't ask her for advice on how to make a fantastic holiday like she always did. It is devastating to be with your own mother and never have an actual conversation. Every time I am cooking and mess something up, I go to the phone to call her, but then realize I can't. I try to embrace what we still have, but I do realize how much we have lost. I try not to think of all of the things we have lost because that makes me too sad. I try instead to think of ways to still include Mom in what she always loved so she knows we care about her and want to help her do what she likes. Mom can not really move her arms and hands anymore so I can't make cookies with her this year. Instead I can make the cookies while she sits at the table and I can talk to her while I do it. She can not go to the West Side Market but at least our house is accessible enough so that she can come for a few hours of the party in her Broda chair. We can't decorate the Christmas tree together, but I can bring out the ornaments and talk to her about them as my son, husband, Dad, and I hang them on the tree. This holiday season will be hard for us like it is for so many people who have their first holiday after a loss. You think of all the things your loved one would have done or would have participated in. You see the glaring holes that are left where your loved one used to be. The thing that is so hard about "dementia loss" is that you keep losing the person over and over again and there is not really any closure. This year is a significant loss and next year if we have lost Mom in body as well, then we have another holiday season of grief and loss on another level. Thank you. Dementia loss has become so pronounced in my mother in the past 2 months that we finally had to place her in an assisted living facility for AD, which I had hoped would not happen. People ask me, even the family, what we're doing for the holidays this year. I can't even think about it. I'm in denial that they will even come along, because I am awash in sadness. It helps to hear from others like this.